After much anticipation and success with his debut album Malmaison last year, 22-year-old Tre Mission is releasing a follow-up: Stigmata. Having composed and shared on the web for years, Tre Mission, though young, has had a strong international following in the Grime scene, which is characterized by fast-action beats and quick turns of phrase. The new album, however, gets a bit more mainstream. The Grime music scene started over in England, with Dizzee Rascal being its most well-known denizen, so it’s not surprising Stigmata is packed with British rappers. Skepta, his brother JME, and Merky Ace – all well-known Englishmen make appearances as well as some homegrown Canadian talent like K-OS and Andreena. Both Tre Mission albums are heavy with outside influence, his lyrical content is kind of west-coast gangster with some English slang thrown in, reggae beats in the background, and of course the staccato Grime rhythm shepherding each song along. But where Malmaison was a true Grime album in the sense that it sounded like it was recorded in a garage with a MacBook and a drum machine and all the songs were bangers, focused on being the kind of music you blare from your car while rolling up to a party; Stigmata gets a little commercial. Though his lyrics come at a million miles-an-hour, the background beats are slowed down, the content gets a little melodramatic, and there are extended refrains. Oh, the refrains. When you speak with the pacing of a racecar engine it’s understandable that you’re going to struggle to make a song last three or four minutes after you’ve said everything there is to say. What Tre Mission seems to have done is just fill up time with refrains. The most frustrating example is the song “Money Make (her)” where Andreena repeats the phrase, ‘Money make her, money make cu-cu-ga, money make her’ – which takes up about a third of the track. As stated before, Grime is at its core street music. Part of its appeal is the low production value and focus on the primary rapper. 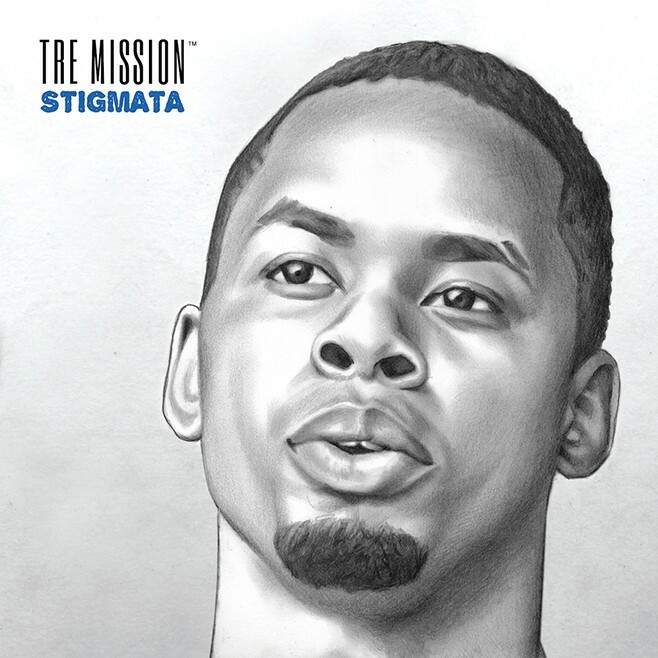 But with Stigmata, and its endless refrains sung by pretty-sounding ladies, Tre Mission has moved away from Grime into pop-rap. This is fine, maybe even natural, artists change and adapt between albums all the time. The problem is that he’s still relying on cheesy drum machines and Spartan production methods to layer his music in a not-very-sophisticated way. If he wants to be a pop-rapper, he’s going to need to get himself a real drummer and read up on sound design. This isn’t to say the album is bad, because it isn’t, but it does have the feel of transition. Tre Mission has gotten quite a bit of attention since Malmaison and all the producers, journalists, executives, got signed by Big Dada, and fellow musicians he’s been around this past year have no doubt had an effect on his style. Therefore, Stigmata can best be described as a piece of a larger project, a step to Tre Mission discovering a whole new style and becoming a star – or – a dalliance before he reverts to his roots and takes Grime to another level – either way it seems he’s destined for something big. We’ll see after the album drops on the eleventh of this month.